Sorry... the 2017 Toyota RAV4 Hybrid is no longer being sold as new. 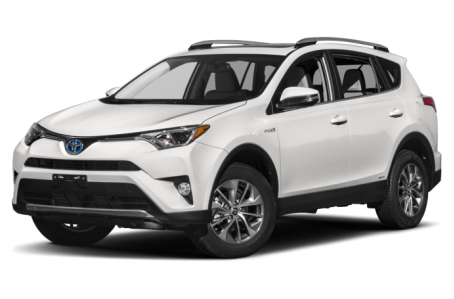 Instead, take the first step to a great deal on 2019 Toyota RAV4 Hybrid with a free price quote! The 2017 RAV4 Hybrid offers even more fuel efficiency over the regular RAV4 compact SUV. It competes with the Nissan Rogue Hybrid and Subaru Crosstrek Hybrid. This year, it remains largely unchanged. Two trims are available: the XLE Hybrid and Limited Hybrid. Outside, the RAV4 Hybrid is virtually identical to the regular RAV4. The front-end features talon-shaped headlights, a narrow-slit grille, and a protruding lower fascia. All around, the underbody trim is mostly clad in black minus the silver skid plate accents at the front and rear. The RAV4 Hybrid comes standard with power/heated side mirrors, fog lights, a moonroof, and 17-inch alloy wheels. Other available features include LED headlights, daytime running lights, and larger 18-inch wheels. Under the hood, the RAV4 Hybrid’s power comes from a standard 154-hp, 2.5-liter 4-cylinder engine and an electric motor, which are mated to a continuously variable automatic transmission and Toyota’s Electric On-Demand all-wheel drive (AWD) system. Fuel economy for the RAV4 Hybrid is an EPA-estimated 34/31 mpg city/highway. Inside, the RAV4 Hybrid has a higher-end interior cabin made with more upscale materials. It comes standard with Toyota’s Entune multimedia system, which includes a 6.1-inch touchscreen, phone-supported navigation, USB port, Bluetooth connectivity for phone and music, Siri-voice recognition, and satellite radio. Other standard features include dual-zone automatic climate control, power windows/locks, tilt/telescoping steering wheel, and remote keyless entry. Heated front seats, a memory seat, adaptive cruise control, an auto-dimming rearview mirror, and a JBL premium audio system are also available. The RAV4 Hybrid earned a full 5-star overall crash test safety rating from the NHTSA. The available Bird’s Eye View Camera package helps the driver by displaying an overhead 360-degree view of the vehicle’s surroundings while parking or driving at low speeds. Also available is the Toyota’s Safety Sense Package, which includes a pre-collision system, lane departure alert with steering assist, automatic high beams, and dynamic radar cruise control. A backup camera, airbags, antilock brakes, an electronic stability system, and a tire-pressure monitoring system come standard. 61 of 62 (98%) consumers said they would recommend this vehicle to a friend.